VAIL LUXURY HOME IS LOCATION ON LOWER SIDE OF WESTHAVEN CIRCLE IN CASCADE VILLAGE ON THE RIVER AND NEAR CHAIR #20 SKI LIFT AND JUST ON THE OTHER SIDE OF RIVER FROM THE HOTEL TALISA RESORT. TICKET OFFICE AND SKI RENTAL STORE IS LOCATED NEXT TO THE CHAIR #20 SKI LIFT AT END OF HOTEL BUILDING. ENJOY OUR 95 feet frontage of the GORE CREEK. 6 PERSON SPA HOT TUB ON OUR DECK (under cover from the weather) with GREAT views on the River. MOST spas are out in the open to the weather and other elements. A 3 - Person FAR-INFRARED SAUNA, Gym Room with a stationary bike with TV. Spacious 3800 Sq Ft + SLEEP 16+ (in beds). You can spread out, if you wish. There's 5 Bedrooms PLUS a Bunk Room (sleeps 4) Two Sets of Bunk Beds. Great for kids or adults. ALSO, a new Queen Size Sofa Sleeper in the family room, should you want to spread out. (it has a Temperpedic mattress, no uncomfortable "bars"). New Baby Crib, PacN play, Hi-Chair, booster chair and one stroller etc. LARGER LIVING, FAMILY ROOM, DINING AND KITCHEN AREAS designed to entertain large families & groups, 2 CAR GARAGE, HUGH DRIVEWAY for parking. By appt: Massage Therapist, BabySitter or Private Chef. Designer decorated with high end furnishings & plush feather beds. We can even do your grocery shopping before your arrival. HOTEL CONCIERGE SERVICES & ARIA SPA/HEALTH CLUB w/SPA discounts & Restaurant & Lounge INCLUDED, just steps from House, FREE HOTEL SHUTTLES AT LOBBY every 15 mins to Lionshead & Vail Village 7AM - mId-night. We book high demand weeks early, so plan according. Walk To Chair #20 Or Ski-In/Out From Hotel: WE ARE CLOSER TO LIFTS THEN MOST PLACES IN THE VILLAGES, WITH NO WAITING IN LINE & MORE TIME ON THE MOUNTAIN! Ride Chair #20 Lift back down anytime during the day until 4 p.m. (last ride down) If you don't want to do any of above, I provide Free Parking right next to the Chair Lift in the Public Garage Parking, especially if you have young children. Charter Sports is located at the Chair #20 Lift, at the end of the hotel building, you can rent skis and equipment and valet your skis at the end of the day (at no charge). Also, we are Just Steps To HOTEL TALISA Resort & Aria Spa/Health Club With all the Amenities including Atwater Restaurant, Starbucks Coffee Shop, Hugh Lobby Bar With Entertainment For Apre Ski. When you stay with us, you have access to The Aria Spa & Health Club Fitness Center, free of charge, plus additional discount benefits. (list available) also at Atwater and for many of the services offered. We Can refer our Private Chef, Massage Therapist, Baby Sitter or Guest Services for dining RSVPs. Huge living/family rooms has large stone fireplace (gas) and HDTV, with two sofas, 3 chairs, sitting bench, gaming table/4, there's plenty of room to enjoy those stories after a great ski day, summer hikes or event! Both rooms are great for kids to play and adults to just hang out and enjoy the fireplace and river and mountain range views beyond. There's plenty of room to spread out but yet come together too. This is a three level house, enter on the street level is the foyer with baby grand piano, 2 car garage, 4th and 5th bedrooms and full bath, exterior patio with fountain. Main level is living, dining, eat in kitchen with BBQ on kitchen deck, 1/2 bath, creek side wrap around deck off living room. Living room and family room, large dining room area, eat-in large kitchen, 1/2 bath and Bunk Room that sleeps 4 on 2 Bunk Bed Sets. Family room can sleep two in Queen Sofa Sleeper, if necessary, there's a door for privacy. Lower level is master bedroom Suite with jacuzzi tub, Safari Suite w/ bath, Gore Creek Suite w/ bath and laundry room. Wrap around Deck with 6-person Hot Tub. This is a great location with easy access so guests can come and go at their pleasure. Once you arrive, you don't have to drive until you are ready to leave. Across the creek, you can walk the bike path to the Lionshead and Vail Village, or take the free shuttle offered at the Cascade Hotel into the village. We having been coming to Vail since 1990, renting several houses each year until we bought our house in 1999. As a Real Estate Broker, LOCATION was most important to us. We bought the house for the easy quick access to the ski trail/chair and fishing location right on the banks of the Gore Creek and to Chair #20 lift. (In 15 MINUTES , YOU ARE AT THE TOP OF VAIL MOUNTAIN AT EAGLE'S NEST) Hiking up Cascade Way and Simba to Eagle's Nest during the Summer is fantastic!!! No lift lines, valet your skis if you want, Charter Sports is right at our Chair Lift #20. You can rent all your ski equipment rentals, also Valet your skis FREE etc. Ski to our street, Westhaven Circle and 5 minute walk back to the house, with NO HILLS to climb! FOR THOSE WHO WANT TO BE REALLY SPOILED, I provide a "Daily Parking Pass" right next to the Ski Lift! Great for little ones or those who don't want to walk anywhere! Aria Spa & Fitness Club is included with this rental house. The Resort and Spa are just 5 minute walk from the house. Discounts on Spa visits and Atwater Restaurant are included. It is so easy for our guests to come and go from the house to Chair # 20 or skiing down to the house, spa, shopping etc without someone having to be there to let them in. We have easy access without using house keys. We love spending our time between Florida and Colorado, living on the Gore Creek, just steps to Chair #20 lift, is the best of both Winter/Summer and Fall. The LOCATION IS GREAT for skiers, fly fishers, multiple families! CME will bring you right to the door and pick you up. If you didn't want to rent vehicles, also, you can ride Hotel Shuttles from Lobby to other villages and return (they run until mid-night) or after dinner, take a short taxi ride back to the house. We can provide grocery shopping,daily housekeeping. Being close to everything but not having to deal with the big or loud crowds. We are closer to Chair Lift #20 than other places PLUS we have ski rentals, ski valet and ticket office all together and we don't have to waste any time waiting in ski lines! (It's like having our OWN private ski lift!) Charter Sports is right there to rent skis/valet or tune your skis. Buy your lift tickets right at the base of the lift. Getting to the top of Eagle's Nest is one easy 'catwalk green' to Chair #26 which (parallels the Gondola to top of mountain) Once you arrive, you don't even have to drive again until you're ready to leave. Our guests can come and go off the mountain with ease. The Vail Cascade Resort offers us the benefits of a resort with our Aria Athletic Club & Spa membership, you get all the benefits plus discounts on Spa, dining/lounge but the privacy of staying in a large private home with plenty of space for multiple families. The views are breathtaking of the mountains and especially being on the Gore Creek. We love being on the creek, the sights and sounds are fantastic. We are the only home in our area that is available for rent on the Gore Creek next to Chair #20 lift and with a large private back yard for play and fishing. This is beautiful neighborhood of multi-million dollar homes. Whether skiing, fishing or coming to Vail for 'Events', having fun especially with multiple families, this house will definitely fit your needs! New for 2017, Air conditioning system. (one of the only houses in Cascade Village) to make July, August and September more comfortable when necessary! New Mattresses & feather beds and down comforters to making sleeping an Art! Included in renting our house, our Aria Spa & Athletic Club Memberships, you can enjoy all the benefits including pools, spas, tennis, best-rated Fitness Club and many activities. Venture Ski Shop rents all ski equipment and summers, they rent bicycles etc. They are located in the Cascade Resort building. Our Front Patio, with new seating and Fire Pit. Enjoy relaxing listening to sounds of the Fountain and River in the background. Last May, we had a Moose visit us across the street from our property. Back patios and decks, enjoy the breathtaking views of the mountains and river or in summers, go down and enjoy fly fishing, games etc in our large private back yard. Weber Natural Gas grill on back kitchen deck, grill to your heart's desire. Living room deck has Patio Furniture and a Bench Swing and Stone Tables and Patio Heater, for the cool nights. Hot Tub Spa is wonderful to enjoy any time of the year, while enjoying the sounds of the river and the views. For health minded guests, enjoy the Far Infarred Sauna, treadmill and stationary bike, filtered water dispenser and vitamix. Private Chef available for dine-in meals. Daily cleaning service available on request - Mid-week cleaning IS included in nightly rate. Master Bath has jacuzzi tub and TV and two way fireplace. Everything in the Vail Valley is so close together, Cascade Village to Vail Village is only 1.4 mile long. Get around by Hotel shuttles, cars or even walk along the Gore Creek on the Bike Path. Resort amenities are included with our Aria Athletic Club & Spa memberships, pool, dining, tennis courts Venture Ski Rental Store at ChairLift. Free hotel shuttles to other villages, don't need car. We are in Cascade Village, 1.4 miles west of Vail Village. We have Hotel Talisa & Resort, Aria Athletic Club other side of river and Donavan Park, grocery stores & restaurants less than 0.5 mile. 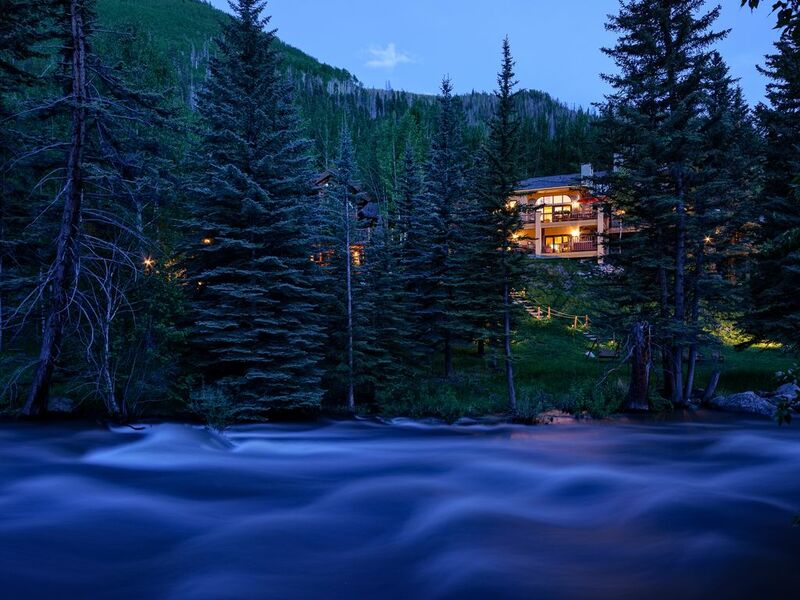 Located in the heart of the Vail Valley, on Vail mountain with mountain views beyond the banks of the Gore Creek in Cascade Village. Short walk east on Westhaven Circle to catch Cascade Way Ski Trail to Chair Lift #20 & Ski Shop and Ticket Office. Takes about 5-7 minutes. Ski down Cascade Way Trail to our Street or ride lift #20. Don't want to ski 5 minutes to Chair Lift? Park Free next to our Chair #20 is an option I provide, a free "parking pass" each day, for garage next to the ski lift or city garages in Lionshead or Vail. We are located on the banks of the Gore Creek. All Rooms but a few, have water views. All Decks, hot tub, dining patio areas all face the river as well. Enjoy the sounds of the river AND the 180 degree view of the river. We are the ONLY house for rent on the banks of the Gore Creek to play games down by river. Relax, seating for 9+ log furniture. We have cordless phones. Local and long distance (in country) free. New 2 Central Heating systems for most comfort. All Linens provided. All beds feature feather mattress covers and down comforters, Bath Robes also provided. (2) sets of washers and dryers in laundry room. (soap and downey free included) Iron and Iron Board provided in laundry room. (2)sets in laundry room and one dryer in garage. 3 total gas fireplaces and 1 electric. Located in Living room, family room, master bedroom, safari bedroom. BLAST Speed Internet. Also, if you have 'NETFLIX' account, you can order movies on the Living room T.V. and the Family Room T.V. Bath towels, Hot Tub Spa Towels and Sauna towels. Far-Infarred Sauna at the house. Aria Athletic Club and Spa membership included when renting our house. BLAST wifi speed with EERO mesh wifi system for best coverage. Hugh Fireplace. Focal area to enjoy the fantastic views…..
(2) New G.E. Profile Refrigerator in Kitchen, 2nd G.E. refrigerator in the garage for drinks/beer additional storage. Plus 24 bottle Wine Refrigerator in Kitchen. 2 - 4 slice toasters. Spices, sugar, dinner napkins, paper towels and all paper products are provided. New: Vitamix for those who want to juice! Dishes/glasses (set of 24) silverware for 24. Large Family Kitchen is fully equipped with TV, Wine Refrigerator, 2 drawer dishwasher, quality cooking accessories , double ovens, at sink is filtered water system and a hot water dispenser. Dishes/glasses/silverware will serve 24. Place mats, dinner chargers etc. The kitchen is large enough for several people to assist the chef. Kitchen also has a High top table in the eat-in area with views to the creek. The counter bar and table has a total seating for 4-6. Outside the kitchen, is a BBQ Grill on the deck area. Dining Room seats 10. Breakfast area is next to dining room, it seats 4 at high top breakfast table and 4 stools at Kitchen Island Counter Bar. Living area table seats 4, if necessary. HDTVs Tv"s in every room including the kitchen and master bathroom!!! (9) 13 TV's!!! TVs EVERYWHERE!!! HDTV/DVD FLAT SCREEN with Surround Sound in Living Room/Family Room HDTV/DVD FLAT SCREEN in Master Suite Flat Screen in Master Bathroom. HDTV/FLAT SCREEN in Colorado Room. HDTV's in Poppy Fields Suite & Safari Suite. and Gore Creek Suites. HDTV/DVD TV in Bunk Room Flat Screen LCD TV in Kitchen. HDTV in Gym/Exercise Room. family games and puzzles etc in the storage cabinet in family room. located off living room level and master bedroom levels. So many choices: Ski equipment and bikes can be rented at SKi Store at Hotel Talisa or for best pricing for extended stays, Vail Ski Techs, Lionshead Village & Charter Sports for skis or bikes. Off kitchen deck, facing the river, the lower patio has a picnic table/umbrella and additional seating to enjoy the massive river views. (4) 6 PERSON NEW CAL SPA HOT TUB ON DECK FACING THE GORE CREEK AND MOUNTAINS. Large front yard and LARGE driveway has a 17 x 24 Front Patio with FIRE PIT and a 2 tier fountain surrounded by seating for 9-10 summer outdoor furniture. On the back side of the house over looking the Gore Creek and the mountain range beyond, there are 2 large wrap around decks. One off the main living level and one off lower bedrooms level (Cal HOT TUB LOCATED ON THIS LEVEL). During the summer months, the main living area deck has a 42' stone table with 4 chairs and a swing bench with coffee tables and propane heater for outdoor dining and entertainment. The Kitchen deck has a BBQ Grill. In the summer, in the back yard, there are outdoor wooden lounging chairs and tables, a 2 person swing, picnic table to enjoy next to the creek. Hotel Talisa ski shop next to chair lift and ticket counter or Vail Ski Tech is best price for ski rentals in the Valley. outdoor courts complimentary with our Aria Athletic Club & Spa Membership. Vail Golf Course is one mile from our house…..or Eagle-Vail Course is 5 miles away. Vail, CO, Great location to ski slopes and Spa & Club amenities are included. Enjoy the NEW Hotel Talisa Restaurant and Lounge. Concierges services, Grocery services and Private Chef Services are also available. I recommend best pricing on other services ie ski equipment rentals or bike rentals. This private house has a spacious floor plan and is suitable for the whole family or multiple families. Large driveway suitable for several vehicles. Front Patio gatherings around a fire pit with the most comfortable patio seating or living room deck seating and dining facing the river and mountains. Only house on the river you can get right down to the river banks with lawn furniture and enjoy outdoor games or a glass of wine. Bring your fishing equipment for best fly fishing in the Vail Valley. 3 person Infrared Sauna and Exercise Equipment:Treadmill, Stationary Bike. With our Club membership, steps from the house. Private and under cover: 6 PERSON CAL SPA HOT TUB WITH WATERFALL ON LOWER DECK, RELAX AND ENJOY THE VIEWS AND THE SOUNDS OF THE GORE CREEK AND MOUNTAINS. All 6 beds have feather bedding and down comforters, all bedrooms have either LCD TVs and TV/DVDs, HDTV/DVD in living room, all services offered through the Vail Cascade Resort & Spa & Fitness Center. Aria Sap and Fitness Club Membership included with this house. Special Discounts for Spa Services and Restaurant discounts, just to name a few. Private Chef, Massage Therapists (house calls) and Private Baby Sitter available upon request at an additional fee. Ruth Ann was brilliant - great communication and great tips. The house is really large - all the beds comfortable and large. We all had our own space. The ameneties were great including a nice hot tub at at perfect temperature. The slopes are 5 minutes away, but Ruth Ann provided parking in Vail or Lionshead allowing us to finish there for Apres Ski and then head home via car. Great having that option. It's a shame we didn't avail of the kitchen to eat in as the kitchen has everything, but maybe next time! Beautiful home, best owner ever! Beautiful home close to the slopes. Perfect for large families or groups of friends. Ruth was the perfect host. Easy to communicate with and left instructions and help guides for everything you could think off. Wonderful view of the creek and close to everything. An amazing week on an incredible house! Maria de los Milagros B. The house is great! We are a family of 15 and we were very confirtable on the house!! The bedrooms are huge and every bed is very confortable. The kitchen and dinning room are big enough for everyone to eat and have a great time! Also Ruth was always available for us which made the hole experience excellent. 100% recommend it for big families! We are pleased that you chose our house after all your research, especially since you and your groups were traveling to Vail from out of country. It was a pleasure working with you in planning for your month's stay, especially because you were planning a year or more in advance, to make sure of availability. Whether you need information on ski tickets, ski rentals, dining suggestions or private chef dinners or whatever the need. It is a pleasure to assist my guests to making their vacation stay the best it can be. You described our house living quarters and location to walk to the ski lift better than I could. Having the house located on the same street as the ski trail, is a nice benefit, considering there are not many houses with such easy access. Also, including our private club memberships for resort amenities, as well as dining and lounge at the Hotel Talisa, add to the resort feel, but with the privacy of your own home and space. Having such wonderful guests, like yourselves, is such a pleasure, thank you! If your plans call you back to Vail, I do hope you will consider our house again! À great and very comfortable house. Everything was great, except for the « five minutes » walk to take the lift. Property is well kept with very good management-everything was as advertised.Good directions from owner re how to use everything.Very well located and owner is most helpful with any questions.Kitchen is well stocked with everything anyone needs and more.For example there were 4 blenders,several coffee makers and all cabinets and drawers were full.Consider this property outstanding and would gladly rent again.Only constructive comment is that there is too much stuff in house and not any tabletop or space without decorative accessories or furniture. We are located on Vail Mountain, just steps on lower Westhaven Circle next to Cascade Way Ski Trail. We offer our personal vacation planning to assist you with groceries, ski rentals, reservations etc, anything you may need to make it stress free planning. INCLUDED AT NO EXTRA CHARGES: OUR Memberships at Aria Athletic Club & Spa with tennis & ball courts, outdoor pool, special discounts for 'Spa' visits and special discounts for dining at new restaurant at New Hotel Talisa. Located at the end of the Hotel building is the Ski Rental Shop right at Chair # 20 with on-line discounts and free Valet of your rental skis. At our house enjoy our INFRARED SAUNA warm up before you head out or after skiing to relax! WALK TO SKI LIFT CHAIR #20 is easy walk down our Street. The Bike Path Trail near our house goes from Minturn to East Vail, walk or ride in summer AND even in the winter too. The paved path takes you to Lionshead or Vail Village (less than 1.4 mile). THIS IS A MUST WALK FOR PEOPLE OF ALL AGES. We just love love love it!!!! The path follows the Gore Creek most of the way. Donavan Park Pavilion is available to rent for Weddings or any other types of events. It is located just west of us house not even 0.4 mile on bike path, you can even WALK there from our house. It also has basketball courts, playgrounds, soccer field, and bathrooms which all are free. BECAUSE OF OUR LOCATION, We have several wedding families and family reunions groups and SKI groups stay at our house. It's GREAT with plenty of room for 1, 2, or 3 families! Vail offers outdoor concerts all summer, rodeos, horseback riding is 2 miles from our house. OUR BACK YARD IS THE BEST GOLD METAL FLY FISHING IN THE VAIL VALLEY. (fishing guide books at the house back this up!) Backyard has outdoor log furniture, swing, picnic table. It's so much fun in summer, play bocce, horseshoes, picnic, BBQ or just fish from the banks of the Gore Creek. Just enjoy the wonderful relaxing sounds of the river and beautiful sunsets. Other Activities: Skiing, using our own Chair #20, like a private lift with NO WAITING LINES...you are NOT waisting time getting up the mountain! Kayaking, basketball, boating, snowboarding, horseshoes, shopping, snow mobiling, racquetball, kids playground at Donavan Park, short walk away from our house. "I WANT TO GETAWAY" SPECIALS. Email me to request prices and dates for available dates! "GETAWAY SPECIALS" only applies to open availability of LESS than 45 days prior to a prospective arrival day. Minimum night stays and prices may apply, depending upon availability and season. Full non refundable payment will be due at the time of booking. The web site cancellation policy does not follow my requirement, see my cancellation policy at the end of these notes. The Posted Nightly Rate is for minimum 7 Nights or more stay. All Other Stays less than 7 Nights are a slightly higher rate of $100-$200/night depends upon the seasons. Starting June 16th through the end of August are all 7 night minimum stays, unless nights are leftover, then 7 night minimum doesn't apply. Holiday Weeks such as July 4th, Labor Day and March Spring Break Weeks are priced at a slightly higher rate, $100-$200/night. Spring Break Weeks are 7 night minimum, if available. We have a popular location and do book early, so to make sure the house will be available, please consider booking asap! MY RATES are based on Cash Payments. I prefer electronic e-Checks, Personal Checks, Business Check, American Express Checks or Bank Wires. My Cancellation Policy: Web site doesn't cover my specific refund policy. My cancellation policy is 50% refund of the First Payment, if the reservation is cancelled MORE than 60 days prior to the check-in date. If cancelled LESS than 60 days,before arrival, there is no refund.